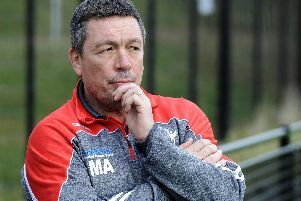 A decision on the Sheffield Eagles futures of Jordan Tansey, Blake Broadbent and Max Garcia looks close, with Mark Aston confirming there is still scope to add to his squad. A flurry of activity during last week saw the Eagles bring Nabil Djalout, Garry Lo and Cory Aston into the club, whilst Aston was also backed with four additions from St. Helens on dual-registration. Despite the incomings significantly boosting Aston’s numbers, the Eagles supremo has confirmed that more additions are likely, with Garcia and Broadbent in particular putting a strong case forward after three weeks training with the Eagles on trial. “We are still looking at Blake Broadbent and Max Garcia, whilst we will also have another look at Jordan Tansey who we need to get up to speed fitness wise,” Aston said. Aston is still waiting for news on centre Menzie Yere who is currently unavailable due to issues with his visa, whilst loan star Lo wasn’t included in the squad but Aston says there are no issues surrounding last season’s star attraction. Whilst there is no definitive time-frame for Yere’s return, Aston suggested Castleford loanee Lo could feature this weekend as the Eagles look to bounce back from last Friday’s opening round defeat at Dewsbury. “I decided not to play Garry having looked at the pitch last Friday,” Aston added.